In this dish the noodles have been cooked in typical Thai spices. 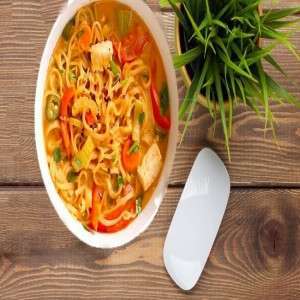 The noodle used is made of whole wheat or quinoa noodle which has great health benefits and helps in weight loss. It has a very high content of fiber much more than any grain and it has low glycemic index which helps in controlling the blood pressure. Quinoa is also very rich source of proteins and it is gluten free. Also the vegetables are used in this recipe which also loaded with vitamins and minerals. Boil the water and cook the noodles and keep it aside. In a wok heat the oil and add lemon grass, thai chillies and saute for 2-3 min. Boil the vegetables and once soft drain the vegetable stock and store it separately. Now add carrots, bell peppers, tofu, bean sprouts, salt and mix well. Now add noodles and vegetable stock to the wok and cook while stirring for 2-3 minutes. Then garnish with coriander and serve hot.